Postać - Trooper - Leader. Punkty: 18/21. Wytrzymałość: 12. 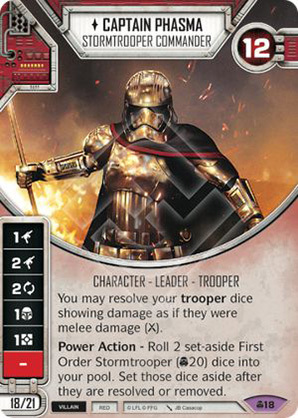 You may resolve your trooper dice showing damage as if they were melee damage (). Power Action - Roll 2 set-aside First Order Stormtrooper ([CONV]20) dice into your pool. Set those dice aside after they are resolved or removed.